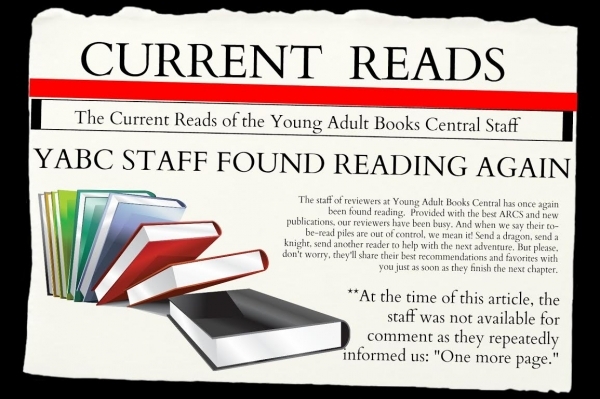 Welcome to the weekly post by the Staff at YA Books Central called Current Reads Monday! know what your book or books your reading as well!! Share, Tweet, and post with the hashtag #YABCCurrentReads! Sixteen-year-old Paris Secord's (aka DJ ParSec) career--and life--has come to an untimely end, and the local music scene is reeling. No one is feeling the pain more than her shunned pre-fame best friend, Kya, and Paris's chief groupie, Fuse. But suspicion trumps grief, and since each suspects the other of Paris's murder, they're locked in a high-stakes game of public accusations and sabotage. Betrayed by the man who had promised her freedom, Dani is now married to the murderous King. It's a terrifying position to be in...and yet it's oddly intoxicating. Power may be an even stronger drug than Glitter--a drug Dani can't resist, in the form of secrets, manipulation, and sabotage. In her new position at the head of the court, Dani must ask herself who she really is. Can she use her newfound power to secure her real love, Saber's freedom and a chance at a life together outside the palace? Or is being Queen too addictive to give up? Lock is awkward. He can’t make eye contact, counts when he’s nervous and has to remind himself several times a day how ‘normal’ teens behave. Homeschooled most of his life, he’s resigned himself to a friendless existence at his new Atlanta high school. List Of Reasons Why My Life Is A Mess: How Much Time Do You Have? West has everything. Looks. Talent. Money. And secrets… so many secrets. Beneath the surface of West’s perfect existence is a pain he’s buried so deep a million therapists couldn’t unearth it and he’s determined to keep it that way. He’s an actor. He can act normal. They don’t fit. Their lives are equal but opposite disasters and the universe just keeps throwing obstacles in their path. Every time they are together they find it harder to say goodbye, harder to keep their secrets, harder not to lean on each other. But for this relationship to have a fighting chance, the two must stop trying to re-write the past and start figuring out how to build a future… together. Warning: This book deals with content which some readers may find disturbing such as eating disorders, past sexual abuse and post traumatic stress disorder. What book are you currently reading? Comment below!